The mountain meadows in the Vosges are very attractive in summer time. Beside birds of the alpine zone one sees some interesting plants like Yellow Gentian (Gentiana lutea), Mountain arnica (Arnica montana), Alpine Pasqueflower (Pulsatilla alpina), Mountain Pansy (Viola lutea). 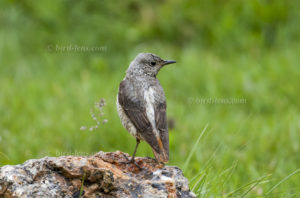 Northern Wheatears (Oenanthe oenanthe), Meadow Pipits (Anthus pratensis) and Skylarks (Alauda arvensis) are certainly the most common species of birds, but some rare bird species live in the cliffs and boulder fields as well. If you are lucky, you may spot the Common Rock Thrush or Rufous-tailed Rock Thrush (Monticola saxatilis) or other “high mountain species” such as Alpine Accentor (Prunella collaris). The scratching sound is unmistakable. Not necessarily the nature lover would consider this as singing. But that’s exactly what it is. With that, the Northern Wheatear is defending his territory. 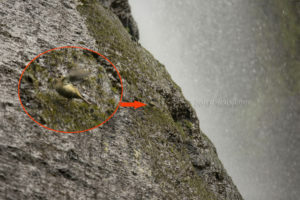 Although the Wheatear is not afraid to present itself openly, it is not so easy to spot the small, black and white colored bird on one of the boulders. Walking a steep trail in search of North-American vagrants under the high cliffs near the little village of Ponta da Fajã on the west coast of Flores eventually I came to a waterfall right beside the hiking trail. I took a rest and was surprised to notice some movement close to the constant shower of water. 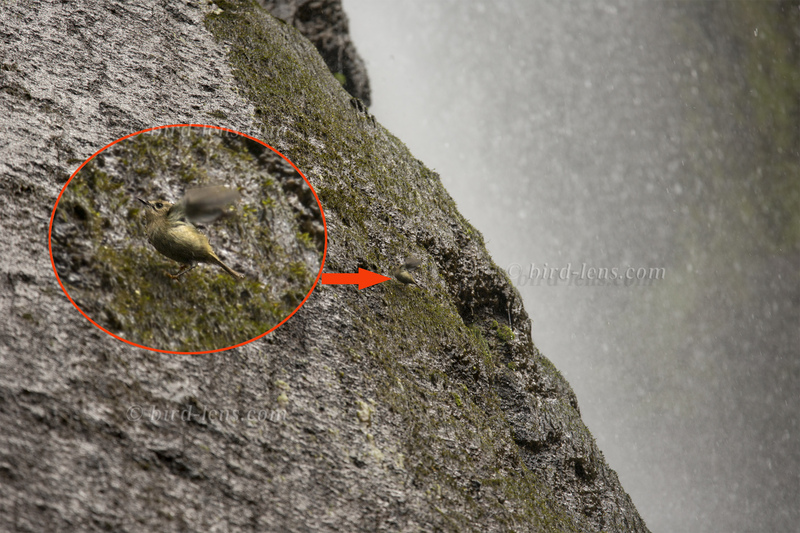 I looked through the binoculars and saw a Goldcrest (Regulus regulus) feeding in the wet mosses on one side of the waterfall which falls down for 30 meters in a little pond. Quite a strange – and open – habitat for a Goldcrest. Obviously the main task was to search for food, but several times the bird raised the wings and it looked as if it was bathing under the waterfall.